Orlando, Florida:: Rachel Simmons,, 20010-2011.. One-of-a-Kind. 14" x 10" x 6" closed, 28" x 10" x 3" extended. Accordion fold structure. Letterpress printed using French Clarendon typeface. Arches Cover paper and Japanese paper with acrylic ink, Sumi-e ink, gouache, pigment powder, thread, screen print, linoleum, carborundum, and transfer prints. 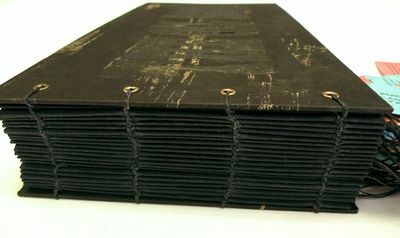 Multi-needle coptic bound with hard cover. Signed and dated by the artist. Rachel Simmons: "In 2010, the Deepwater Horizon Oil Rig exploded in the Gulf of Mexico; it took 86 days to stop the flow of oil into the water and the damage to the marine ecosystems was devastating. I witnessed the emotional and financial impact on my family in the Florida Panhandle and I wanted to better understand this terrible accident within the larger context of the history of oil exploration. Researching major global oil spills since 1967, I was not surprised to find that humans have spilled billions of gallons of oil into rivers, lakes, and oceans, and that many of the spills have gone unnoticed or even unreported. In other words, Deepwater was a catastrophe, but it was just another disaster in an industry riddled with disasters. "The book uses French Clarendon, a typeface from the 1800's for the text which repeats several times, 'rude crude spill will soak sea brown black clean green American dream.' These prints were created through layering letterpress, serigraphy and carborundum and then mounted in pairs on each spread. Each print was washed and splattered with ink to evoke the colors of the marine landscape and the alien quality of the invading oil. Each printed word is unique despite the repetition of the poem. The text is often obscured by images of the Deepwater Horizon rig. On each left-hand page, a quote from Karl Marx printed in black on black reads, 'history repeats itself, first as tragedy, second as farce.' A tangled mass of colored price tags hangs from the book's spine, revealing dates and locations of the worst oil spills in recent history.